Today, more than 50 years after a sniper’s bullet took King’s life, the idea of the world house is as relevant now as it was then. “We are now faced with the fact that tomorrow is today. We are confronted with the fierce urgency of now,” wrote Dr. King. The 2019 Martin Luther King Jr. Memorial Lecture at Gustavus Adolphus College will feature the Rev. Dr. Luke Powery as the keynote speaker. Held on Monday, January 21 from 10 to 11:30 a.m. in Christ Chapel, the lecture, Diversity in Adversity: Martin Luther King, Jr., and the Promise of the “World House,” will explore Dr. King’s idea of the “World House” and its relevance for living in today’s diverse world. Powery is a dynamic speaker and author whose interests are at the intersection of preaching, worship, and culture, particularly expressions of the African diaspora. 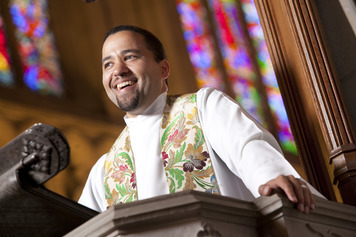 He is the Dean of Duke University Chapel and Associate Professor of Homiletics at Duke Divinity School. The day’s events include a Critical Dialogue workshop from 2:30-4 p.m. in Cec Eckhoff Alumni Hall at Gustavus. This facilitated discussion will explore how to build authentic community across racial, ethnic, national, socio-economic and religious divides. Following the Gustavus events, Mankato’s 35th annual MLK Community Celebration will be held from 5:30-7:30 p.m. at Minnesota State University, Mankato. The celebration features remarks by the Rev. Dr. Powery and presentation of the 2019 Pathfinder Awards. RSVPs are required for the Mankato MLK Community Celebration. The morning lecture and Critical Dialogue workshop are free and open to the public. Powery’s morning lecture will be streamed live online. To learn more about the annual Martin Luther King Jr. Memorial Lecture at Gustavus, visit gustavus.edu/events/mlk/. Information about Mankato’s 35th annual MLK Community Celebration is available at mankatodiversity.org/mlk-community-celebration.